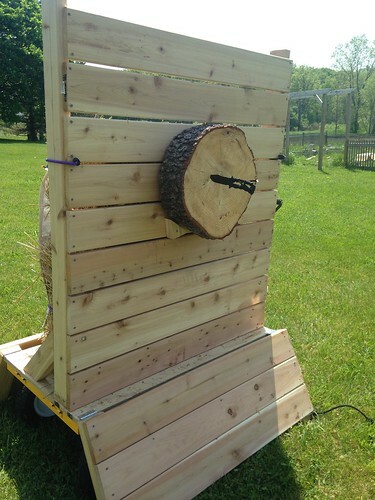 It became clear that I was going to need some kind of portable target that could be easily moved around the property, so a year ago I started brainstorming ideas, but never really got around to building anything. Then, for Christmas this year my dad got me throwing axes and knives… which is just what every girl needs, obv. 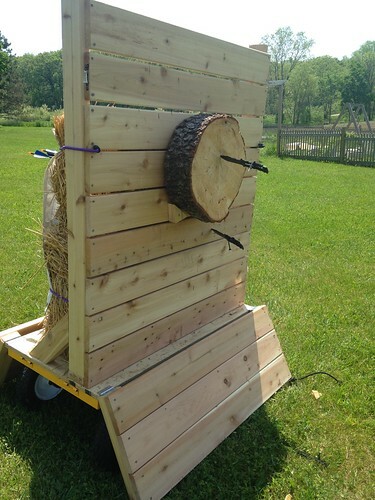 And after using the dwindling wood pile behind my barn for target practice a few times, I knew I needed to get a real target set up, so I scoped out a few options for bases and settled on this garden wagon with detachable sides from Menards. The nice thing about this wagon is that the handle has a regular hand grip, or can be fit to a mower hitch to tow it around. It also holds something like 200 lbs., and has all-terrain tires. 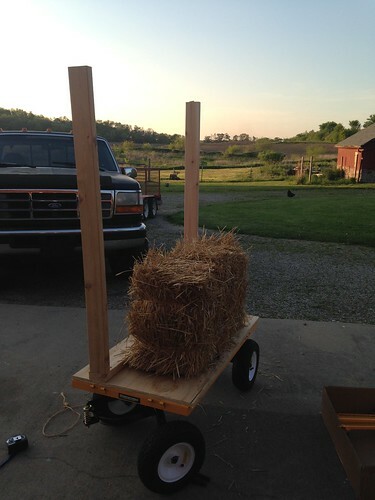 Then framed out the target area (roughly 5′ from the deck of the wagon) with some cedar 2×4’s, with enough space so that I could fit a couple of straw bales on one side of the platform. Then I added cedar deck boards for the backstop (leaving about 1/4″ between boards so some wind can get through). 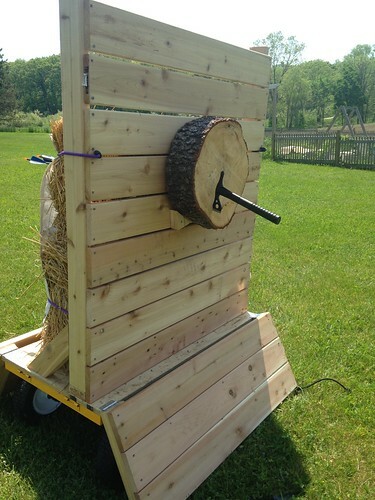 And, when folded down, add vertical stability to the whole target while also protecting the wheels. I’ve got some 18″ bungee cords that hold them in place when their up, and I also bought some metal stakes that I could use to stake through holes in the wings to secure it to the ground if necessary… it’s really not necessary thought because they work really well on their own, and we’ve put this through the paces. I thought it was going to be so heavy that I’d have to use the mower to pull it around, but it’s actually super easy to just move by hand… it is a little top heavy with that chunk of pine attached to one side though. I may build some counterweights underneath the wagon to keep it stable when moving, but for now I just take it easy or ask someone to stabilize it when we move it from place to place. 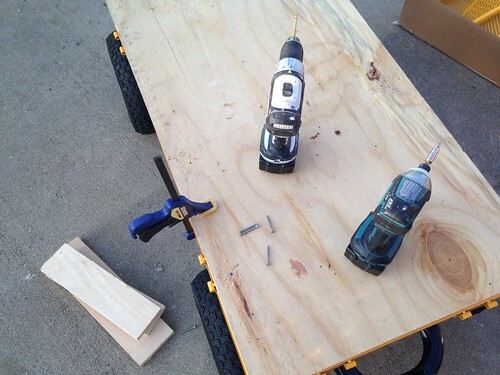 All told this took 3-4 hours to build (start to finish) and around $200, most of which was for the wagon. It can easily be moved to different parts of the property depending on what we’re doing, and packs away into a relatively small space in the garage. And, let’s be honest, after a long day, it’s fun to have an excuse to drink a couple of beers and throw some axes at things. Are you sure you aren’t starting Camp Black Feather? 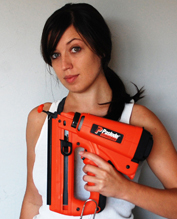 Your portable target is genius! It looks like so much fun. Could it be used for riflery too? I love reading your updates. Thanks. Thank you for this! My 28 yr. old daughter has throwing knives, bow and arrows and a crossbow. She will love having this! Can’t wait to show her so she can build one. 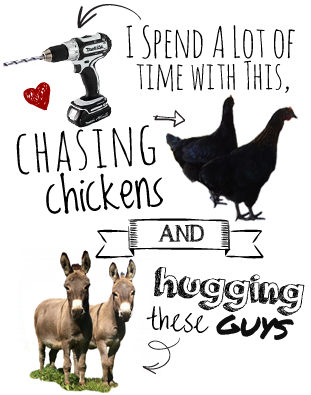 I think if your end game is winery B&B petting farm empire, you’re well on your way!!!! After living in an/ apt/condo for 30 years I have finally purchased a house! So instead of living vicariously through you perhaps I can live through myself a little bit more. Only .25 acre in the city, but I have some space and can put in a garden and use all my power tools and build stuff! It’s a 1958 house and I wish I knew a little more about the possibility of asbestos in the wall’s. No popcorn ceilings luckily….. I want to knock out a wall, but I don’t want to violate any laws by not checking for asbestos first and also while I’m not super worried about asbestos I still have respect for doing this the right way. i am amazed, as usual, at your ingenuity, creativity, and ability to actually craft what is in your head. totally genius!!! I can’t tell me how much I LOVE this project. I want to get started right away, Thanks for sharing! 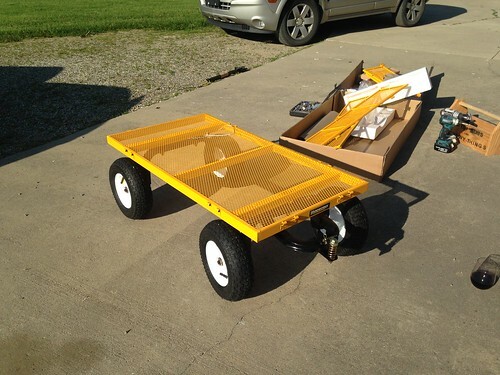 Super sweet idea having it over a wagon to be able to move it around. Love the ax throwing log. 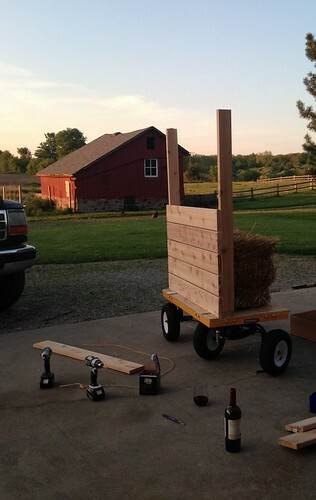 I wouldn’t of thought of the wagon. . .nice work! Awesome design! 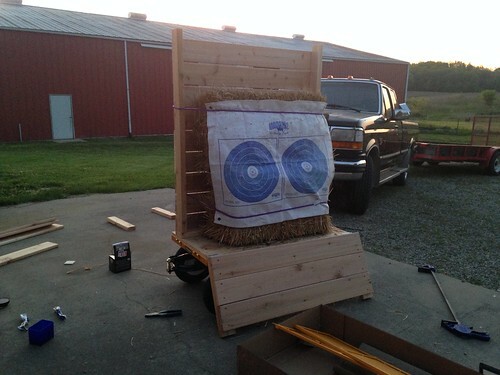 Looking for inspiration/ideas for a more sturdy axe throwing target for our backyard and I believe his is it! 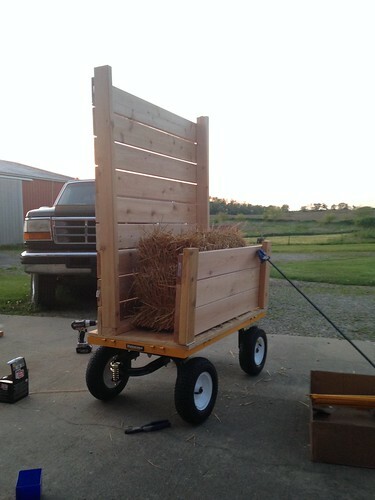 Wagon is such a great idea!! Hubby loves throwing and now I am addicted as well!! Have an arrangement of logs right now but wanted to surprise him with a sturdy piece of art. Thank you!! Is it possible for u to share a pic of the braces you used? Again…thanks! >And, let’s be honest, after a long day, it’s fun to have an excuse to drink a couple of beers and throw some axes at things. I never realized how much I’d like to have an axe target and some axes until now, lol! That does sound like a good way to unwind after a hard day. 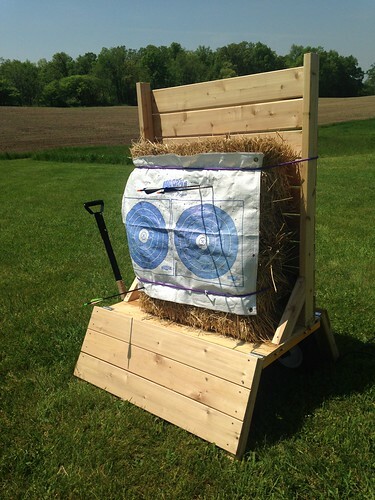 And it’d be great to be able to invite people over to “throw some axes”. Thanks for this great idea. I’m going to be building this, this month.